Checking the traffic stats of my blog I noticed that the energy drink reviews I wrote last year have become moderately popular (by moderately, I mean two or three people OTHER than my mother have read them). Since I wrote those articles, a few new energy drinks have popped up in stores so I thought I would take a crack at reviewing this new group of drinks. Now that those formalities are over with, let’s take a look at 5 new energy drinks and see if they are the real deal, or if they should be tossed into the landfill along with that giant pile of Atari E.T. game cartridges. Let’s find out. Vault Red Blitz – I reviewed Vault and Sugar-Free Vault (now called Vault Zero) in Part II of Death By Taurine. In short, it’s a very sweet tasting Citrus soda with no energy kick. I was pretty harsh to Vault originally, but I’ve grown to enjoy Vault Zero a little more lately. Despite the confusing marketing as a “hybrid energy soda”, I stand by the opinion that Vault is rockin’ no energy boost whatsoever. Despite this, Vault must be selling fairly well because Coke just released the “berry-infused” Red Blitz. “Berry Infused”?! Could we be a little less specific? What kind of berry? Raspberry? Cherry? Boysenberry? Snosberry? WHAT?! Well, I think it’s cherry, but it’s hard to tell because the berry flavor is actually just as generic as the moniker. The generic berry flavor is good mixed with Vault’s base citrus flavor, but once again, Vault didn’t get the memo that energy sodas are supposed to give you a boost. I’m also sad that there is no Vault Zero Red Blitz, but I hope they release one soon because I would drink it. Energy Fiend says it would take 195 cans of Vault to kill me. 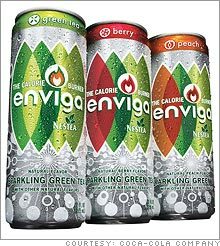 Enviga – Like many things Coke related (see Vault), this drink has had a huge marketing campaign. A lot of it extolling the virtues of it’s calorie burning properties. Yes, according to Coke, the green tea extract and other herbal ingredients cause you to burn more calories digesting the drink than the drink contains, thereby creating a negative calorie situation. This is, of course, absurd, so Coke is in a little controversy right now about false advertising. All that aside, the drink is only okay. The AMC theaters my wife and I go to give these out for free if you are a MovieWatcher member and buy a combo. So I’ve tried the Green Tea and Berry flavors for free. I actually bought the Peach version but had to give myself a V-8 slap in the forehead after tasting it because it was sweeter and not as good as the other too. All three, though, are almost too sweet and sugary for my taste, but if Jack Bauer had me tied to a chair and was threatening to kill my wife and shoot me in the kneecap if I didn’t pick one, then I’d say Berry is better. Give them a try, if you don’t like them throw back a Coolah instead (see review below). Energy Fiend says it would take 136.5 cans of Enviga to kill me. Full Throttle Blue Demon – I reviewed Full Throttle in Death by Taurine Part II. I said it is my favorite tasting energy drink, but there is no energy kick whatsoever. Well, Coke released a Blue Agave flavored Full Throttle aimed at the Hispanic market recently so I decided to try it. This flavor is apparently named after a famous Mexican wrestler called Blue Demon, and the blue agave flavor is very popular south of the border. It definitely tastes different than original Full Throttle. The taste is closer to the SoBe energy drink I reviewed in Death by Taurine Part I. It’s a more fruity and less Mt Dew taste. I honestly didn’t really like it. Reminded me too much of the SoBe debacle, although I was able to finish this can whereas I was not able to finish the SoBe can. Again, like it’s Full Throttle brethren, Blue Demon forgot to stand in line when they were passing out energy boosts in Soda Heaven so it comes to the table without one. It’s like Coke is “waving its private parts” in the general direction of the energy drink market. Release versions of their regular soda with a little more caffeine and call it a day. Well I say “Nuts to you, Coke!” Energy Fiend says it would take 96.81 cans of Full Throttle to kill me. Mountain Dew AMP – You may see the Mountain Dew logo on the can and ask yourself, “what is the difference between Amp and MDX?” Yourself probably won’t have an answer. But my answer is, “one is an energy drink and one is an energy soda.” WTF does that mean?! I don’t know, Coke started this whole “energy soda” business with Vault. It’s just Coke and Pepsi trying to create new crap out of old crap for us to buy like the good little consumers we are. So…..I bought it. 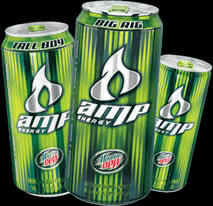 Regardless of the shoddy marketing, Amp tastes very similar to Full Throttle and has the same missing energy boost. The name says it all, it’s an amped up Mountain Dew (caffeine-wise). Also, Amp recently, like Vault, got a flavor extention called Amp Overdrive. It’s a cherry flavored version, much like Red Blitz. I think I like Amp Overdrive better than the original Amp, but not as much as Vault Red Blitz. I did get a noticeable energy kick from drinking the Amp Overdrive, but it may be because I drank the “Big Rig” can which holds double the normal amount of drink. Does the world really need a “Big Rig” of Amp Overdrive? I mean, really? They should change the name from Big Rig to “The Urine-ator”. It gave me the longest pee ever. Seriously, it was like the perfect storm. Unbelievable. But I digress. I had the Amp Overdrive at 8am and I was still buzzing by bedtime. That’s some serious energy kickage. There is no sugar free Amp, so you are drinking over 200 calories with each can. A good choice if you don’t mind the extra calories. Energy Fiend says it would take 182 cans of Mt Dew Amp to kill me. Coolah – Coolah is an Australian energy drink (CRIKEY!!) based on another drink called Solo. Hey Australia, why hasn’t there been a Crocodile Dundee energy drink, or a Crocodile Hunter energy drink? WHY?! The world is begging for them!! NOW!! Anywho, Coolah has a surprisingly mild, lemony taste. In fact, it’s taste is extremely similar to Sprite, with a little extra lemon flavor. It’s very good. Unfortunately it comes in the newer 16oz cans with which I have a little trouble finishing (much like the “Big Rig” above). Who really needs this much energy drink? You could wake the dead with cans of this size. It’s crazy. With regular soda you only get 12oz in a can, but with energy drinks that have twice the caffeine, sugar and taurine (and, sometimes, calories), you get an extra 4oz. Why? It’s ludicrous…and I don’t mean the rapper. The energy kick is pretty bitchin’ too. Wow, it’s like I’m sitting in a wind tunnel, but I’m actually just at my desk. This is one of the nicest buzzes I’ve had in a while (legally, of course, haha). That energy high lasted until bedtime, too, with very little energy crash. This may take the crown as my new favorite energy drink. So grab a can of this magic elixir and enjoy the ride, bro. Energy Fiend says it would take 91 cans of Coolah to kill me. Updated!! Death By Taurine Part IV now online! This entry was posted on April 16, 2007 at 8:00 am and is filed under Coca Cola, Death By Taurine, humor, reviews, soda with tags Coca Cola, Death By Taurine, reviews, soda, sodapalooza. You can follow any responses to this entry through the RSS 2.0 feed. You can leave a response, or trackback from your own site. Is what true? The reviews? This is a good share. Thank you! It was great finding your post. I believe my husband died because of these drinks. He was perfectly healthy, but liked the energy drinks. He died from a heart arrhythmia. One year later, my best friends husband was found dead on the kitchen floor. He also died from an arrhythmia & loved drinking the energy drinks. Both were under 45 & physically fit & healthy. I think something needs to be done & class action suit needs to be started. Where can we begin? in finding this matter to be really one thing that I think I might by no means understand. reason why I am unable to subscribe to it. Is there anybody else having the same RSS problems?